NEW YORK - A group of freshman from Dover High School in New Jersey enter a dark hallway at 97 Orchard Street, on Manhattan's Lower East Side. Past ancient walls, under a flaking tin roof, they knock on the door of one apartment. A young woman with a kerchief wrapped around her head and an old-fashioned long skirt and apron answers, in an accent that's hard to place: "Yes?" The teens are introduced to her as a family of Italian immigrants who have just arrived in the U.S. Can they come in? 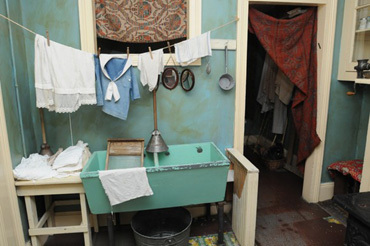 After an initial hesitation, 14-year-old Victoria Confino ushers in the group to a modest parlor in the family's two-room apartment, which includes some converted crate furniture and baby clothes hung out to dry. There are photos of Victoria's family on the wall, the Sephardic-Jewish Confino family from Kastoria. There is also a 1906 black-and-white photo of their city on the wall and pages from the Judeo-Spanish Ladino language newspaper that Victoria's father, Abraham, reads daily. It's 1916 - or at least that's the year Tenement Museum staffer Lily Paulina must act like it is, as she plays Victoria Confino, an historic figure in New York's rich immigration patchwork. On this school tour, Paulina never drops the role, as she slips in Spanish words and tries to engage the shy teenagers in a game where they are all immigrants within a tenement apartment on the Lower East Side. The Niarchos Foundation was driven to support the project, explains Vasilakis, because of the unique Greek connection. He explains: "The history of Sephardic Jews is a very important part of Greek history. So we thought that the museum tells something that is very, very important." Though she says "Kastoria" (pronounced with a Ladino accent) incessantly throughout the tour, Confino doesn't ever actually say the word "Greece." This may be because the Confinos arrived in the U.S. in October 1913, just as Greek control over the region in Northern Greece was solidifying after the Balkan Wars. When asked by the youngsters, many of whom are Spanish speakers, if she is from Spain, she says: "Do you know Ottoman Empire?" When the kids look a little blank, she adds: "We come from Turkey." Kastoria after the immigrated to the U.S. in 1913. When asked what happened to send the family away from their beloved Kastoria, she mentions a fire that destroyed their shop and home, but also the wars of her era. "They started to take Jewish boys," she said. Though Victoria Confino told the "immigrants" about local shops, factory jobs and the glories of the U.S. education system, there was also lighter talk. The teenagers asked her what the orange fluffy sheepskin on the bed was. She replied with a question. "Do you have one?" One teen boy quickly piped in, "No. We are trying to buy one," with his classmates bursting into laughs. 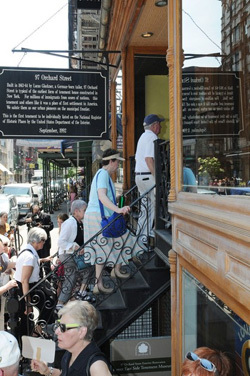 On a recent weekday, this student tour was part of a non-stop whirl of activity at 97 Orchard Street and the Tenement Museum's newly-added 108 Orchard gift shop. People of all ages, including many senior citizens, chatted and waited for their tours and buying gifts from a huge selection of New York history souvenirs. "Can the tour group from Syracuse gather in the auditorium for an announcement?" one of the team of employees announced. According to the museum, demand for tours is up by 20%, though charitable giving has dropped from $2.4 million in 2008 to $1.5 million in 2009. The Niarchos grant will serve as a major boost, notes Tenement Museum President Morris Vogel. He told TNH that the Niarchos funding may allow the tour to expand to seven days a week. Vogel underlined that the Lower East Side was one of the first neighborhoods where Greeks in New York settled. Today, he noted, one-third of those who visit are from Europe. Kate Stober, who manages the museum's public relations, noted that among the visitors to the exhibit are the relatives of the original Confino family, who were very helpful in providing information about the family's history. On a rare occasion, notes costume interpreter Lily Paulina, people visit who actually speak Ladino. "It's frustrating," she notes, because they are the ones who are the most excited by the history - yet of course, that's when she can only take the game so far. Since its founding in 1996, in the name of Greek shipping magnate Stavros Niarchos, the Niarchos Foundation has provided some $1.2 billion in 1,800 grants in 90 countries. Among major recent grants were aid for the Haitian ($500,000) and Chilean ($250,000) earthquake victims. The US spring/summer grants for 2010 include medical and other scholarships. Beneficiaries range from the scholarship programs of the Greek Orthodox Archdiocesan Cathedral of the Holy Trinity in New York, to the Medical Institute of the University of Notre Dame to a plan for Brooklyn's Waterfront Greenway. In 2015, the foundation aims to unveil $744 million Cultural Center in Athens, which will include a national library, opera and culture park - all designed by the Italian architect Renzo Piano. To play the game "Become an Immigrant," featuring Victoria Confino, on the Internet, visit: www.tenement.org/immigrate. 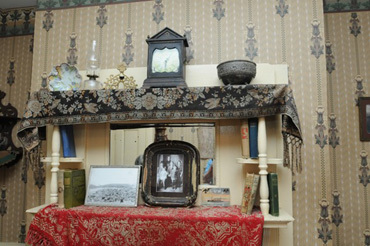 In light of the Stavros Niarchos Foundation's recent grant to support The Tenement Museum's tour of a Sephardic-Jewish family from 1913 Kastoria, TNH visited the museum on May 26, 2010. The Niarchos Foundation recently donated $500,000 to support the exhibit/tour.